At AMG we utilize a wide variety of mechanical presses; both hand transfer and progressive style dies to provide stampings in a variety of materials for our customers. 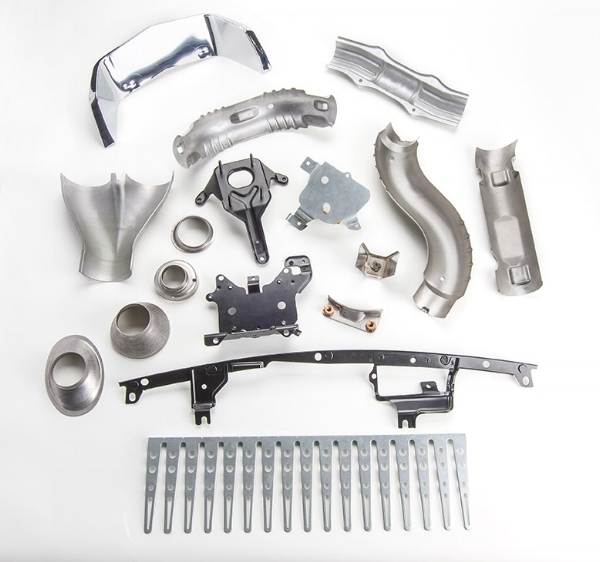 Examples of product offerings include structural reinforcements, heat shields, pipe straps, brackets, etc. Our press tonnage capacity ranges from 10 to 300 tons and consists of bed sizes up to 96" x 72". In addition, we have extensive punch press capability with a variety of equipment that includes precision and high-speed ball bearing gibbed presses, automatic straight-sided and OBI presses. Progressive high-speed dies are a design specialty of our staff engineers. Our ability to design, build, and maintain dies also gives us the capability to expedite prototype development within our various product lines. In addition, in an effort to reduce lead time and pricing, we have begun using 3-D printers for our prototype builds. Along with our stamping capabilities and products, we also offer finishing capabilities and features for our customer's products, including laser cutting for precision finishing, polishing, plating, coating, and painting.